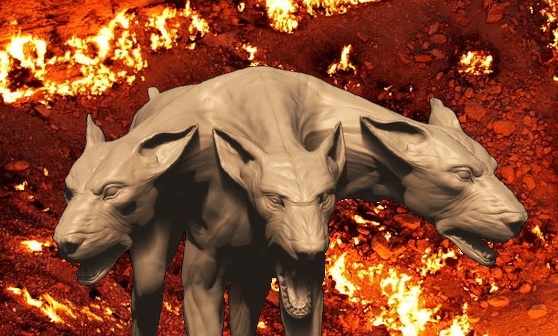 Depiction of the three headed dog Cerberus from Greek and Roman mythology guarding the gates of hell (the background is actually the existing "Gates of hell" in Turkmenistan. Composite of two images. The dog is File:Canino.png created using the Sculpt tool in Blender 2.43 by Giuseppe Canino and licensed under the Creative Commons Attribution-Share Alike 2.0 Generic license. The Background is the image File:The Door to Hell.jpg by flydime and licensed under the Creative Commons Attribution-Share Alike 2.0 Generic license also on Wikimedia Commons.